Mount Ruapehu is still an active volcano. It is, by no means, an unusual thing for it to experience volcanic activity at any given point. Indeed, small scale activity is a regular occurrence. Yet, sometimes larger, more significant, events occur. Ruapehu has been noted for having it’s major eruptions occur roughly 50 years apart. Although, there will intermittently be other sizable events in between. 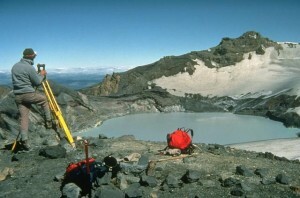 In recent history there have been five significant volcanic events on Mount Ruapehu. The months between August and November 1945 saw numerous eruptions from Mount Ruapehu. The eruptions created heavy showers of ash which interfered with skiing activity. It also effected the water supply to the Chateu causing the abandoning of its use for a short period of time. The eruptions also created a ice, rubble and ash dam around the crater. This tephra saw the crater fill up melted snow and rise in depth. The tephra from the 1945 eruption kept the crater lake had kept the waters of the crater lake stable for a number of years. Yet on the 24th of December 1953 this came to an end. The tephra burst, allowing for a flow of lahar to race down the mountain. Eventually, Whangaehu River was hit by the lahar and the Tangiwai Bridge which crossed it, collapsed. An express passenger train was derailed on the collapsed bridge causing the loss of 151 lives. The eruption of 1995 occurred on the 25th of September but warnings signs and preemptive activity had been noticed for months earlier. Since the November of 1994 there had been sightings of increased eruption intensity and a higher lake temperature. Eventually, sightings of lahars caused the Department of Conservation to issue safety warning for the volcano. The eruption emptied over half of the crater lake, in the form of a lahar that traveled to the Whangaehu River. 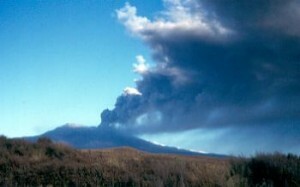 The ash cloud released from the volcano reached a height of 10 kilometers above the crater. Airports across the North Island were shut down and air travel across the central North Island was forbidden. On the 17th of June 1996, the first day of staff induction and training for the Whakapapa ski slopes, an eruption occurred. In strength it was similar to the 1995 eruption and resulted in the mountain being closed for the entire ski season. The tephra dam created by the 1995 and 1996 eruptions collapsed, causing a lahar to once again come down the mountain. No injuries or significant damage was recorded. It also served as a test for the government installed Eastern Ruapehu Lahar Alarm and Warning System, which detected the lahar and closed of nearby road access automatically. 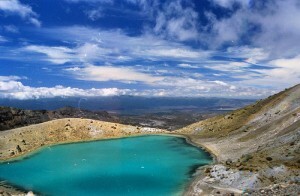 The 25th of September of the same year saw an eruption occur on Mount Ruapehu. One tramper was trapped at the Dome Shelter, near the crater, when a rock from the eruption landed on his leg and was too heavy to lift of. No other injuries are recorded.